Most of us are pinching pennies...investments have disappeared, jobs are being lost, hours cut back..etc.. 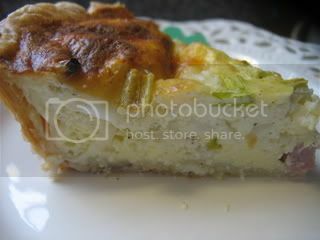 So today for Foodie Friday, hosted by Gollum's lovely blog, Designs by Gollum, blog I made Recession Quiche.. Please click on the link to sample some of the other delicious entries..
1 cup of milk,I used low fat, and it was still nice and creamy..
Another Irish treasure to share..
Look closely..find the 4 leaf clover and you will have good luck...maybe a pot of money to get us through the recession??? You will have to take my word for it, I did find a bargain! I have to research what the orig price is so I can get more of a WOW reaction when I post it.. Thanks for coming by, and come back soon..and of course for the party on the 17th..OPEN house here! I love quiches! I'm off to steal the recipe! What delish looking choice for today! Thank you for sharing! I have never made one before and I think I can now. I'm so happy that you should a slice of this fluffy Quiche. I thought it looked scrumptious from the outside, but the sliced piece really showed off it's tempting creamy inside. I've not had ricotta in quiche before. I bet that adds to the creamy texture. I remember the 2 squares comment ...Sheryl Crow, wasn't it"
The quiche looks wonderful.... what a pretty crust ... What kind of pan did you use? It's lovely. I love your PK plate and I do NOT have that pattern. I cannot believe you don't have the hydrangea. Not even going to touch the toilet paper comment, LOL, you can thank me later, Kathleen! The quiche looks so good! Now you have me craving a quiche. How'd you do the crust? I'll thank you now, Carol! 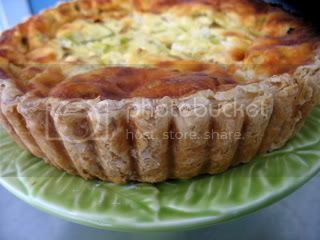 It is a puff pastry pushed into a deep tart pan, the kind with the removable bottom...so easy! And the quiche couldn't be more simple..
Mike doesn't like quiche, but I told him this was like a Calzone..and it was! Quiche I love, but only make it when I'm having guests..
Love the PK plate..that is definitely one of the prettiest ones!!! I'm prejudice.. I haven't made a quiche in awhile..but I am glad you reminded me...a good use for leftovers! That looks so good, Kathleen! There's nothing wrong with a quiche, resession or not! I love the PK plate. Is the 4-leaf clover to the left and slightly below center? 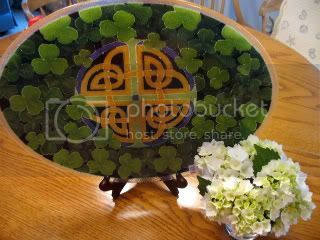 I am loving all of your photos and the early St. Patrick's pictures. I love your recipe--with all of the bountiful eggs on the farm, we are quiche and salad people. Your quiche sounds delicious! It looks so pretty, and perfect! I love all your sidebar pictures, too. I am enjoying your blog! Kathleen, love the looks of your quiche. Oh, and all your Irish decorations! Happy Happy Birthday, to you! Hope you have a wonderful day and Mike does something special for you. Puff pastry in a deep tart pan .... looks wonderful. I love puff pastry. Happy Birthday, Kathleen .... Hope you have a wonderful day. Kathleen, you're the Queen of Sales, LOL! Miss your humor on GB. Hope Mike has a surprise or 2 up his sleeve! 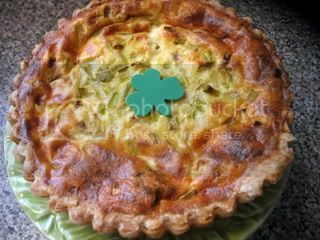 Congrats on FG Kathleen, what a great photo of your quiche. I love your idea of using the puff pastry, makes it so much easier. And Happy Birthday pal!! I'm looking forward to joining you for your St. Patrick's Day party. I'll be bringing Irish Soda Bread, your recipe!!! How did I miss this post yesterday? It is all so wonderful Kathleen, from the fun narrative, to your beautiful quiche to your PK. and may you have MANY MANY more happy birthdays!!!! what a wonderful economical breakfast choice. BTW - when you get a chance I have an award for you on my blog today. Thank you everyone for the birthday wishes, and for visiting me. I appreciate it! I don't think you can ever go wrong with quiche - yours looks especially delicious. I just found your site. It is beautiful. I look forward to catching up with it! 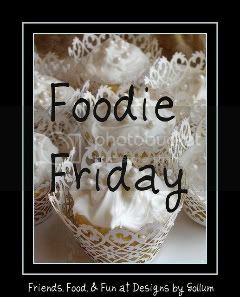 Foodie Friday **** Flashback Friday. Happy Birthday and Tablescape Thursday! Did you ever have Thumbits?